Styled with gradilla thermal and equator legging knee . Packable, light yet super warm! This coat is the perfect layer on so many Spring and Fall days, and even warmer days in the winter, that I would have given it 5 stars except for one thing. It has a terrible double zipper. With the length, you need the double zipper but this one is the worst. It's constantly stuck. Since I don't Iive in the city I'll probably buy a zipper and have a seamstress put it in. Suggestion for next year: Charge $5 more and use a decent zipper. This is probably the first Aritzia item I've been unimpressed with as my wardrobe is composed almost entirely of your clothes. True to size, great spring coat. This is my favorite. I’ve bought 2 of them. Washed it multiple times and still looks great!!!!!!! I wore it all winter in Canada as a winter coat and kept me warm and looking cute. I love taking this jacket for travelling since it fits so nicely into the pouch and keeps me warm! I love it so much that I gifted a bunch to other people!! Perfection! Love it so much. Warm and fits like a glove. This jacket is very light, very comfortable! It’s very light and comfortable, but slightly smaller. Warm but long length if you're on the shorter side! Super lightweight and easy to pack away into a small pouch. Good for cooler weather. You're only able to layer a thin long sleeve or sweater under this otherwise it would be a tad snug. One thing I didn't like was the length, it hits about at the knee for me and I would have liked the hem to end mid-thigh. Fits really well. Not great for super cold weather and wearing layers underneath. Great for casual wear in the City or to work. 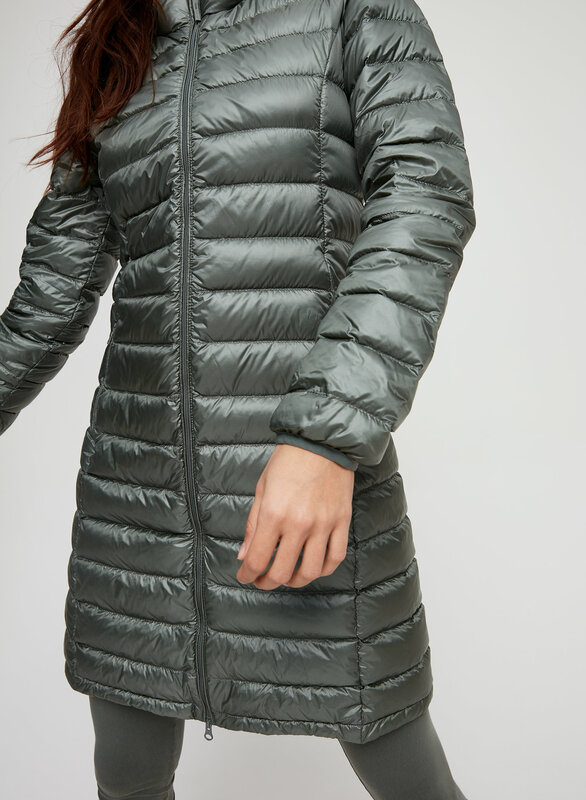 This puffer is perfect for travel or everyday shopping - super light-weight but packs a punch on warmth. Layer up underneath on colder days; easily squish into the carry bag while in the mall or out and about - anywhere and everywhere! Compact and wrinkle proof - 2 must-haves in 1. Although it does fit slightly smaller (as most of the reviews claim) I was able to stick with my usual size S and can still layer with a long-sleeved shirt and a sweater underneath. Form fitting yet comfortable! This is the second one I’ve purchased. The first zipper eventually got stuck and brok off. Once I really looked the seam is off. Aritzia was nice enough to exchange it but the replacements zipper seems to be getting stick to. I will be exchanging this one soon or possibly returning if they’re all like this. Great fitting coat love it. Not for snow weather but great for Vancouver. I love the colour of this coat I get a lot of compliments it’s perfect for Vancouver. I have not had it that long I think it’s dry clean only which is not a positive thing but it might be the best. The fit is perfect for my slim and tall bodytype. I am usually a small but went up to a medium due to tightness across my chest which never happens because I have a smaller bust. I don't think this jacket would fit those with larger chests as the fabric does not stretch. Other than that the jacket is nice and warm yet light and stylish. Perfect for walking the dogs in the cold and at night. Excellent fit, comfortable and warm. Glad I was told to size up. Great jacket! Weirdly warm for being so thin! Great layering piece; as well as affordable enough to get multiple colours for different outfits. Lightweight and compact - Great for traveling! I had to size up to a size Medium because it's a long style and the silhouette is pretty snug. I would recommend girls with hips and booty to size up or try it on in-store first. Especially if you're planning to wear anything thicker than a tee shirt underneathe. It can also get annoying when it's unzipped and it touches the ground when you're crouching down. This coat has been perfect for these chilly west coast days at the park with my kids. Love the hoodie too! My girlfriend bought the same one! Love the look of this cost. Fashionable, light weight, warm and comfortable! Fits small, but still really cute. Purchased this in dark shadow, love it! Light weight and warm. Ordered 2 jackets in black and grey, kept the grey one and it was great! It is quite thin, and fits smaller than expected. 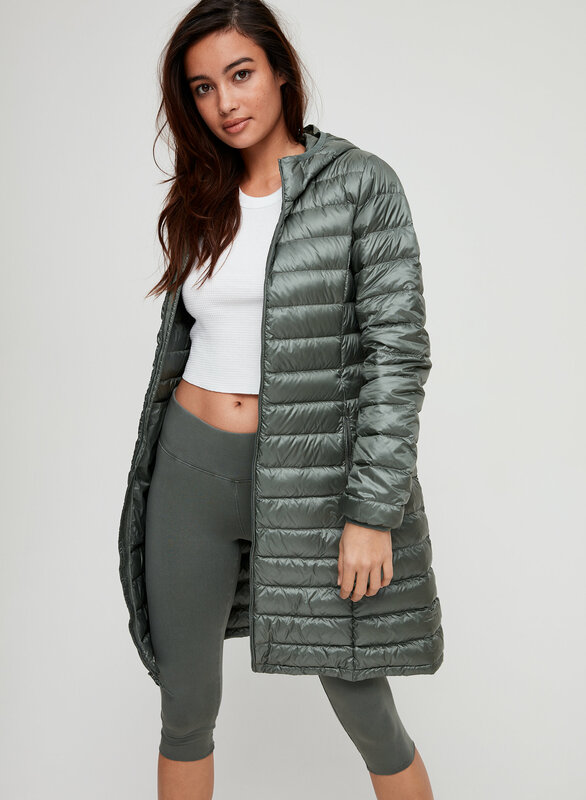 I live in Bay Area and this puffer is just right for winter. I normally wear a sweater layering with the puffer and it feels very comfortable and stylish. Love this jacket. Perfect for the in between winter days where its not cold enough for a parka. They've definitely changed the sizing from last year, a large doesn't zip up around my hips this year and last year it fit perfectly, I have not changed in size. Surprisingly warm and very comfortable. I have a Stedman wool coat that I absolutely adore, but I found it wasn’t quite enough for particularly cold winter days on the east coast. This puffer was a great solution! Fits perfectly underneath my coat, and adds a good amount of light insulation. My only complaint would be that the zipper feels a little weak. I’m not sure how it’ll hold up over time. Light weight, great for traveling. Easy to throw on and walk out of the house on those dreary days and feel comfortable and warm. I’m 5”2 and ordered an xs. Fits perfect would definitely recommend! You will use this jacket more then you think. This is my first aritzia purchase. Beautifully made and super warm. The XS is definitely a slim fit, no room for a heavier top underneath. But with this warmth, you don't need anything warm underneath! It's slightly snug, size up so you can be comfortable even with the zipper all the way up! Looks classy and fashionable! Was expecting would keep me more warm under minus 20. 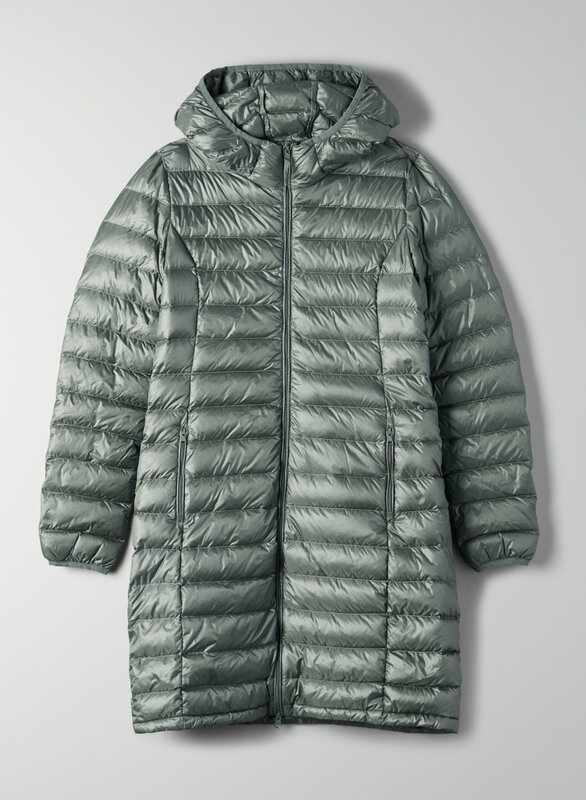 Great lightweight puffer and actually folds into the packable pouch easily. Warm enough for transitional fall to winter days to full-blown snow days. I'm 5' 4", would have liked it to be a little bit above my knees but overall happy with the coat. Great coat at a great price! The coat was everything I was looking for. It's puffy and warm enough for Seattle weather. It's long, going down to about my knees. It's waterproof, or at least water resistant. And it's got a hood. For those qualities, it's pretty affordable. The only thing that really bothers me is that the zipper comes undone from the bottom up. It never stays shut when I'm walking. I would not recommend as a winter coat for that reason. If you're looking for a fashion coat to layer, this might be a better option. I’m 5’5 130lbs small fitted perfect. A fitted fit, if you want it to be roomy I would go to a medium. Love the style!! Usually for medium or large, but had to get an XL. It's a slim fit. It's super light and I can store in a small pouch that comes with it. I love the colour! Thin,so comfortable! My friend recommended me.but I will also share it with my friend. Love this coat!!! Light weight yet stylish! Love it. Super light weight, warm and so cute! Love it! Not too heavy and very warm! This coat is perfect for fall and also travel. Especially if you travel somewhere warm from somewhere cold as I do. You can roll up and pack it. Light weight but keeps you warm.